ENS Steve Wall collecting a bottom sample. Wednesday, I went on a launch to do bottom sampling and cross lines. Wednesday was our last day of data acquisition, so the motto on the POD (Plan of the Day) was “LEAVE NO HOLIDAYS! If in doubt, ping it again!” Bottom sampling is pretty straight forward. We drive to designated locations and drop a device that looks a little like a dog poop scooper down into the water after attaching it to a wench. The device has a mechanism that holds the mouth of it open until it is jarred from hitting the bottom. When it hits the bottom, it snaps closed and hopefully snatches up some of the sediment from the bottom. Then, we reel it up with the wench and see what’s inside. We took 10 bottom samples and most were the same. We had a fine brown sand in most samples. Some samples contained bits of shell, so we documented when that was the case. At one location, we tried for samples three times and every time, we got just water. This happens sometimes if the sea floor is rocky and the device can’t pick up the rocks. If you try three times and get no definitive answer, you label the sample as unknown. Two times we got critters in our samples. One critter we found was an amphipod most likely. The second critter was shrimp/krill-like, but I don’t know for sure. Cross lines are just collecting sonar data in lines that run parallel to the previous data lines. This gives us a better image and checks the data. Survey Tech Christie and Me on our bottom sampling launch. 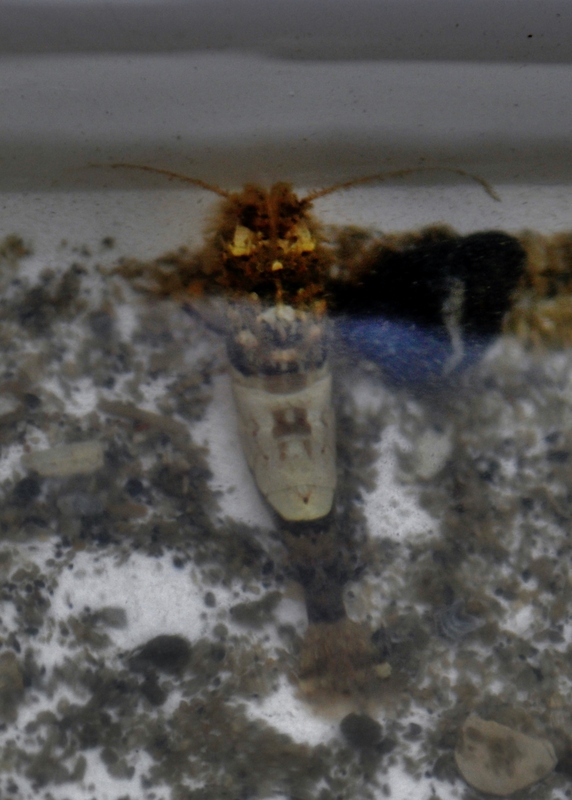 Amphipod found in bottom sample. 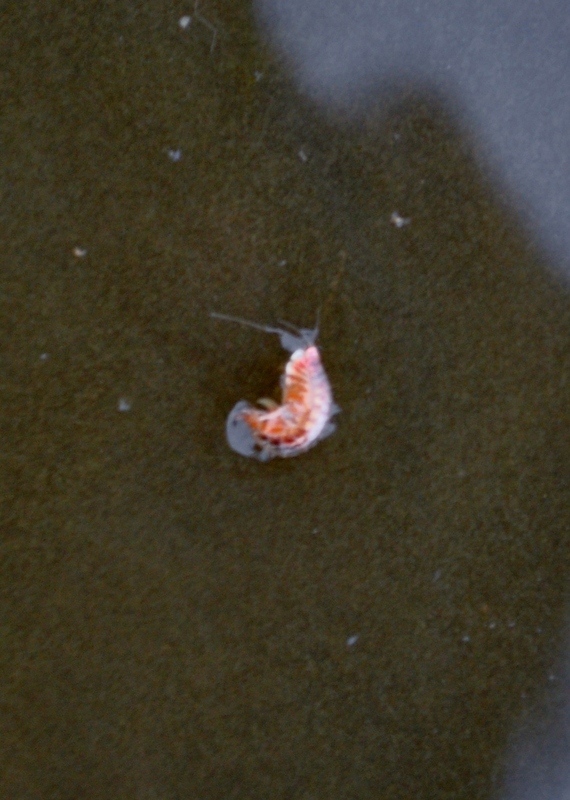 Unknown shrimp/krill critter from bottom sample. Staff observations at Terror Bay. Thursday, we closed out the tidal station at Terror Bay. This entailed doing staff observations, a tidal gauge leveling check, and then break down everything including completing a dive to remove the orifice. Since I have already taken part in a tidal gauge leveling check, I was assigned to the staff observations and dive party. As I mentioned in an earlier post, for staff observations you just record the level of the water by reading a staff every six minutes for three hours. We did this while on a boat, because the tide was pretty high when we got started, so we wouldn’t be able to read the staff if we were on shore. 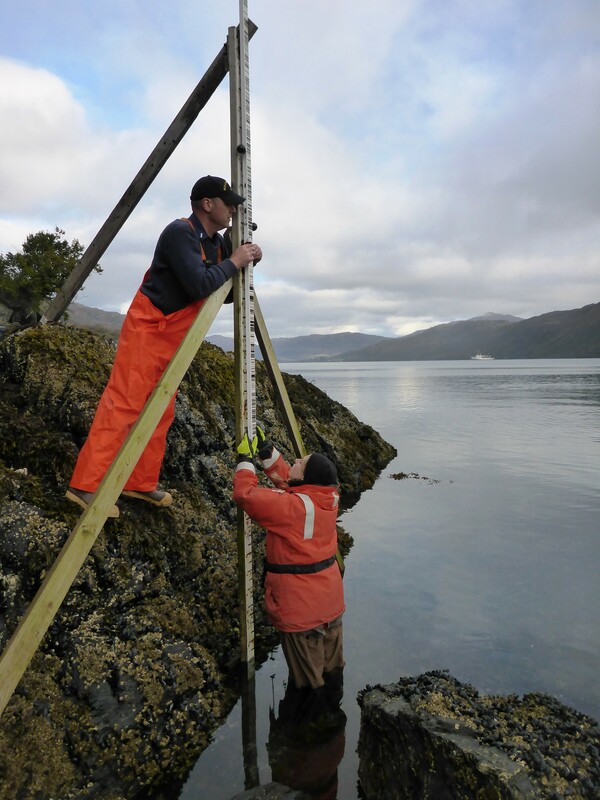 Again, the reason we do staff observations is so we can compare our results to what the tidal gauge is recording to make sure the tidal gauge is and has been working properly. 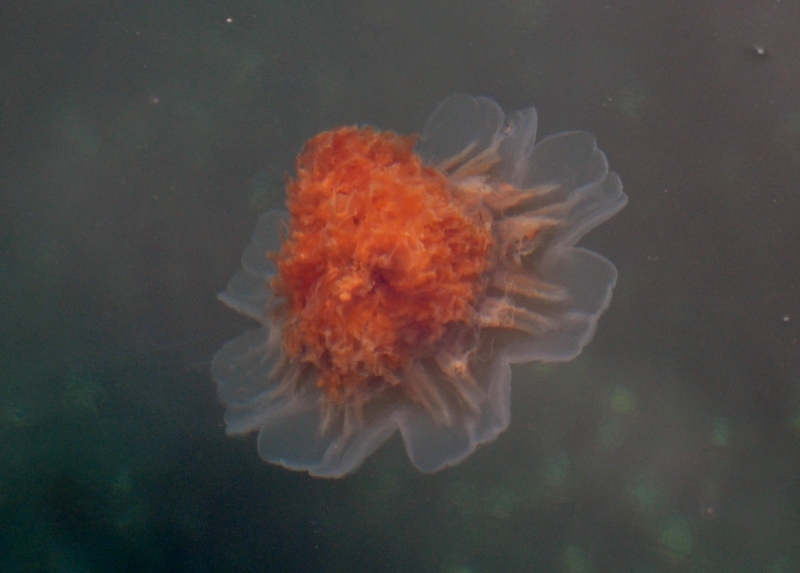 While doing staff observations, I saw a small jellyfish looking creature, but it was different. It had bilateral symmetry instead of radial symmetry. Bilateral symmetry is what we have, where one side is more or less the same as the other side. Jellyfish have radial symmetry which means instead of just one possible place you could cut to make two side that are the same, there are multiple places you can cut to make it the same on each side. Also, the critter was moving by flopping its body from side to side which is nothing like a jellyfish. I had to figure out what this was! In between our observations, Jeff, the coxswain, maneuvered the boat so I could scoop this guy into a cup. Once we finished our staff observations, we headed to the ship. I asked around and Adam (the FOO) identified my creature. 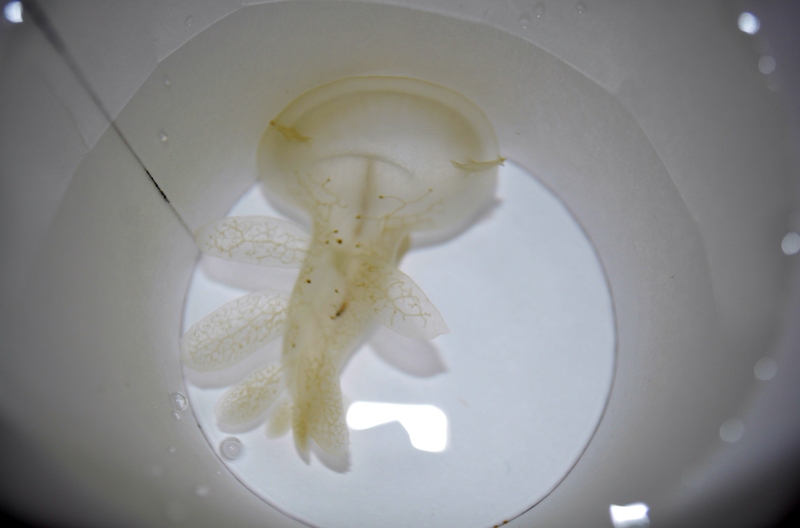 It’s a hooded nudibranch (Melibe leonina). Nudibranches are sea slugs that come in a beautiful variety of colors and shapes. ENS Wood and ENS DeCastro diving for the orifice. After a quick return to the ship, we headed back out with a dive team to remove the orifice from underwater. Quick reminder: the orifice was basically a metal tube that air bubbles are pushed out of. The amount of pressure needed to push out the air bubbles is what tells us the depth of the water. Anyways, the water was crystal clear, so it was really neat, because we could see the divers removing the orifice and orifice tubing. Also, you could see all sorts of jellyfish and sea stars. At this point, I released the hooded nudibranch back where I got him from. Just as we were wrapping up with everything. The master diver Katrina asked another diver Chris if he was alright, because he was just floating on his back in the water. He didn’t respond. It’s another drill! One person called it in on the radio, one of the divers hopped back in the water and checked his vitals, and another person grabbed the backboard. I helped clear the way to pull Chris on board using the backboard, strap him down with the straps, and pull out the oxygen mask. We got him back to the ship where the drill continued and the medical officer took over. It was exciting and fun to take part in this drill. This was a very unexpected drill for many people, and they acted so professional that I am sure if a real emergency occurred, they would be prepared. Sadly, this was most likely my last adventure for this trip, because I fly out tomorrow afternoon. This trip has really been a one-of-a-kind experience. I have learned and have a great appreciation for what it takes to make a quality nautical chart. 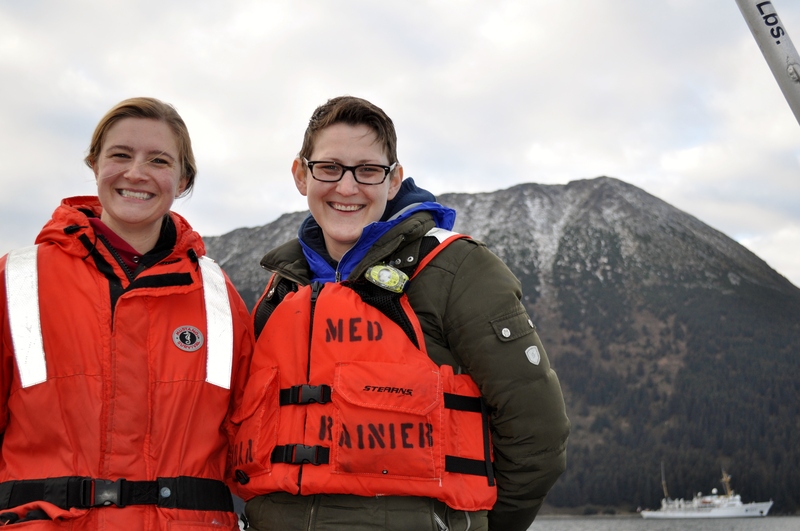 I am excited about bringing all that the Rainier and her crew have taught me back to the classroom to illustrate to students the importance of and the excitement involved in doing science and scientific research. Thank you so much to everyone on board Rainier for keeping me safe, helping me learn, keeping me well fed, and making my adventure awesome! 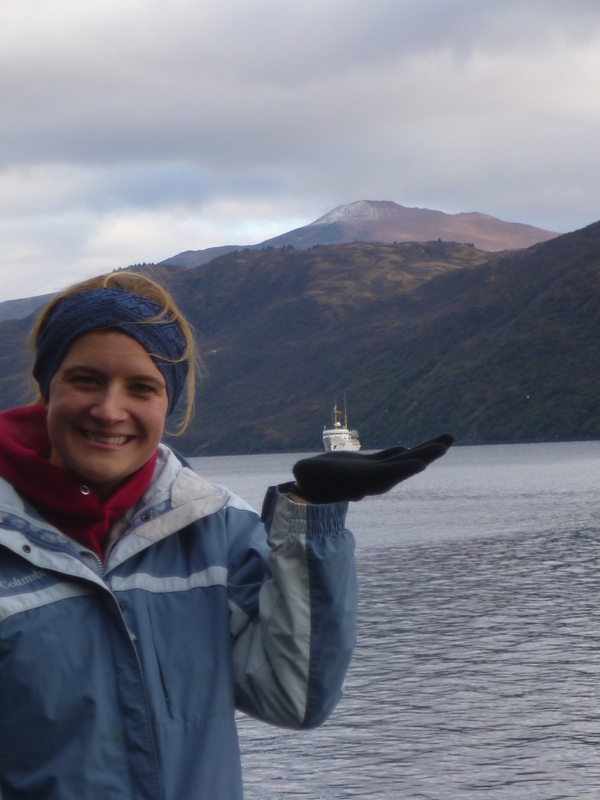 Also, thank you to all those people in charge of the NOAA Teacher at Sea program who arranged my travel, published my blogs, provided me training, and allowed me to take part in this phenomenal program. Lastly, thank you to my students, family, and friends for reading my blog, participating in my polls, and asking great questions. 1 knot is one nautical mile per hour which is equal to approximately 1.151 miles per hour. Can you figure out what my unknown shrimp/krill critter is? Thank you all for the comments you all have made. It helps me decide what direction to go in for my next post. One question asked, “How long does it take to map a certain area of sea floor?” That answer, as I responded, is that it depends on a number of factors including, but not limited to, how deep the water is and how flat the floor is in that area. To make things easier, the crew uses an Excel spreadsheet with mathematical equations already built-in to determine the approximate amount of time it will take to complete an area. That answer is a bit abstract though. I wanted an answer that I could wrap my head around. The area that we are currently surveying is approximately 25 sq nautical miles, and it will take an estimated 10 days to complete the surveying of this area not including a couple of days for setting up tidal stations. To put this in perspective, Jefferson City, TN is approximately 4.077 sq nautical miles. So the area we are currently surveying is more than 6 times bigger than Jefferson City! We can do a little math to determine it would take about 2 days to survey an area the size of Jefferson City, TN assuming the features are similar to those of the area we are currently surveying. Try to do the math yourself! Were you able to figure out how I got 2 or 3 days? Since we’re talking numbers, Rainier surveyed an area one half the size of Puerto Rico in 2012 and 2013! We can also look at linear miles. Linear miles is the distance they traveled while surveying. It takes into account all of the lines the ship has completed. In 2012 and 2013, Rainier surveyed the same amount of linear nautical miles that it would take to go from Newport, Oregon to the South Pole Station and back! 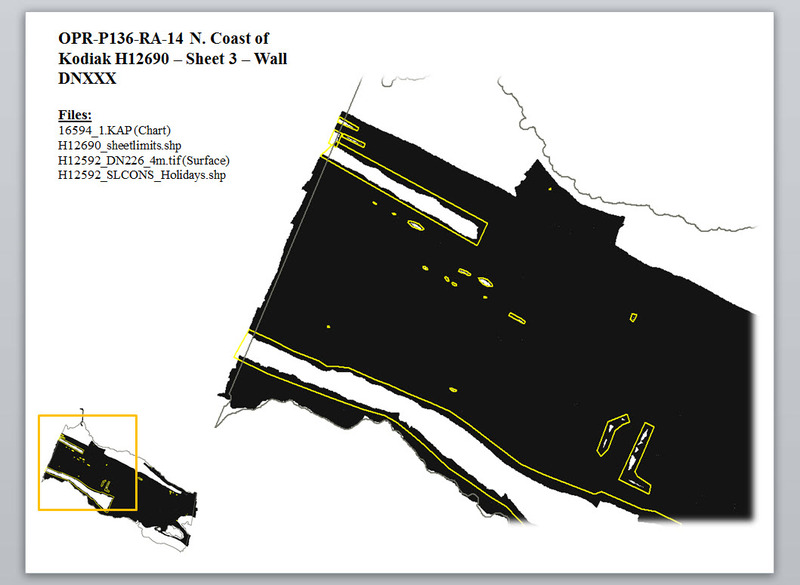 Area we are currently surveying (outlined in red) with some depth data we have collected. Casting a CTD (Conductivity, Temperature, and Depth) gauge. Monday, I went on a launch to collect sonar data. This is my first time to collect sonar data since I started this journey. 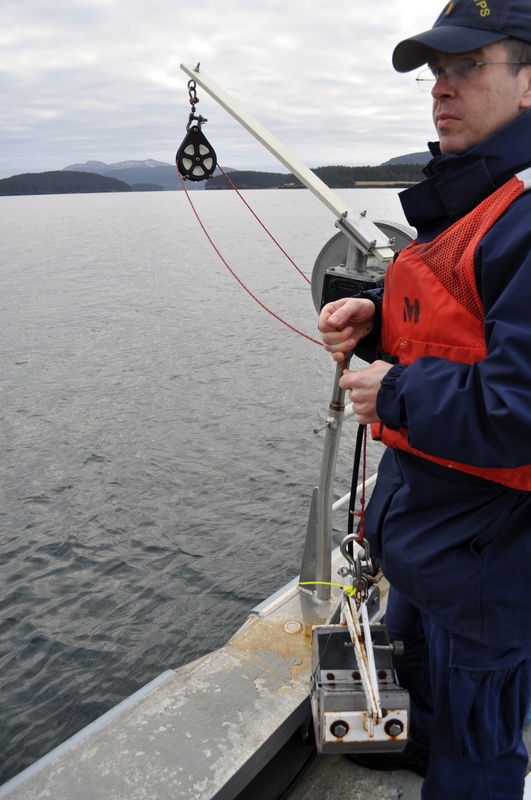 Before we could get started, we had to cast a CTD (Conductivity, Temperature and Depth) instrument. Sound travels a different velocities in water depending on the salinity, temperature, and pressure (depth), so this instrument is slowly cast down from the boat and measures all of these aspects on its way to the ocean floor. Sound travels faster when there is higher salinity, temperature, and pressure. These factors can vary greatly from place to place and season to season. Imagine how it might be different in the summertime versus the winter. In the summertime, the snow will be melting from the mountains and glaciers causing a increase in the amount of freshwater. Freshwater is less dense than saltwater, so it mainly stays on top. Also, that glacial runoff is often much colder than the water lower in the water column. Knowing all of this, where do you think sound will travel faster in the summertime? In the top layer of water or a lower layer of water? Now you understand why it is so important to cast a CTD to make sure that our sonar data is accurate. To learn more about how sound travels in water, click here. After casting our CTD, we spent the day running the sonar up and down and up and down the areas that needed to be surveyed. Again, this is a little like mowing the lawn. At one point, I was on bow watch. 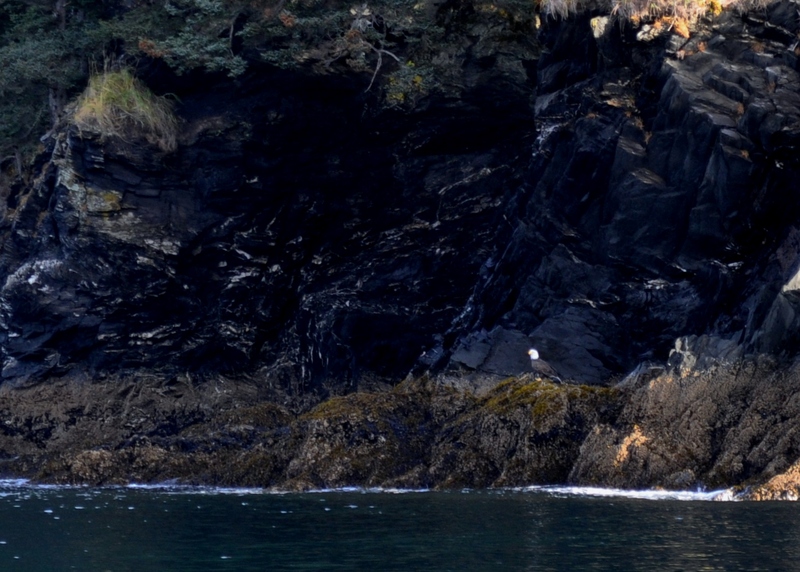 On bow watch, you sit at the front of the boat and look out for hazards. Since this area hasn’t been surveyed since before 1939, it is possible that there could be hazards that are not charted. 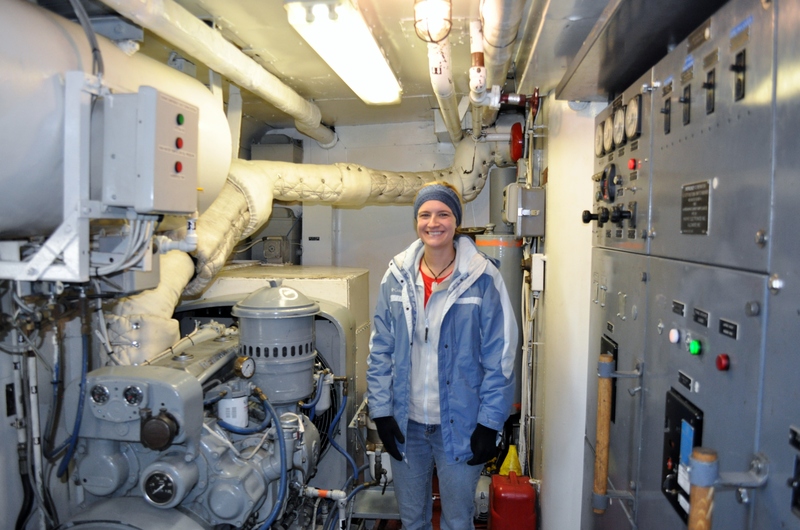 Also, I worked down in the cabin of the boat with the data acquisition/sonar tuning. Some important things to do below deck including communicating the plan of attack with the coxswain (boat driver), activating the sonar, and adjusting the sonar for the correct depth. I helped adjust the range of the sonar which basically tells the sonar how long to listen. If you are in deeper water, you want the sonar to listen longer, because it takes more time for the ping to come back. I also adjusted the power which controls how loud the sound ping is. Again, if you are surveying a deeper area, you might want your ping to be a little louder. Eli working the sonar equipment. Tuesday, I helped Survey Tech Christie Rieser and Physical Scientist Fernando Ortiz with night processing. When the launches come back after acquiring sonar data, someone has to make all that data make sense and apply it to the charts, so we can determine what needs to be completed the following day. Making sense of the data is what night processing is all about. First, we converted the raw data into a form that the program for charting (CARIS) can understand. The computer does the converting, but we have to tell it to do so. Then, we apply all of the correctors that I spoke about in a previous blog in the following order: POS/MV (Position and Orientation Systems for Marine Vessels) corrector, Tides corrector, and CTD (Conductivity, Temperature, and Depth) corrector. POS/MV corrects for the rocking of the boat. For the tides corrector, we use predicted tides for now, and once all the data is collected from our tidal stations, we will add that in as well. Finally, the CTD corrects for the change in sound velocity due to differences in the water as I discussed above. After applying all of the correctors, we have the computer use an algorithm (basically a complicated formula) to determine, based on the data, where the sea floor is. Basically, when you are collecting sonar data there is always going to be some noise (random data that is meaningless) due to reflection, refraction, kelp, fish, and even the sound from the boat. The algorithm is usually able to recognize this noise and doesn’t include it when calculating the location of the seafloor. The last step is manually cleaning the data. This is where you hide the noise, so you can get a better view of the ocean floor. Also, when you are cleaning, you are double checking the algorithm in a way, because some things that are easy for a human to distinguish as noise may have thrown off the algorithm a bit, so you can manually correct for that. Cleaning the data took the longest amount of time. It took a couple of hours. While processing the data, we did notice a possible ship wreck, but the data we have isn’t detailed enough to say whether it’s a shipwreck or a rock. Senior Tech Jackson noted in the acquisition log that it was “A wreckish looking rock or a rockish looking wreck.” We are going to have the launches go over that area several more times today to get a more clear picture of is going on at that spot. 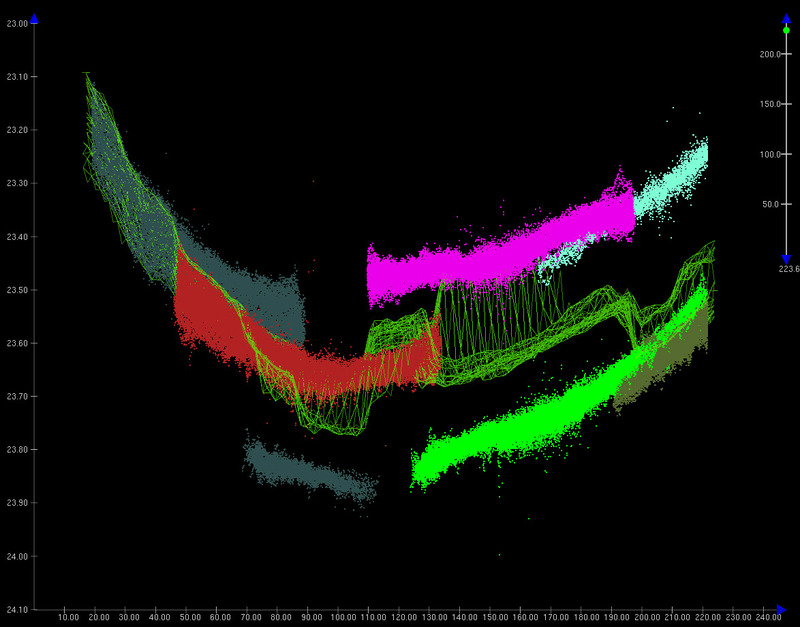 This is an example of noisy data. In this case, the noise was so great that the algorithm thought the seafloor went down 100 extra meters. Manually cleaning the data can adjust for this so our end product is accurate. 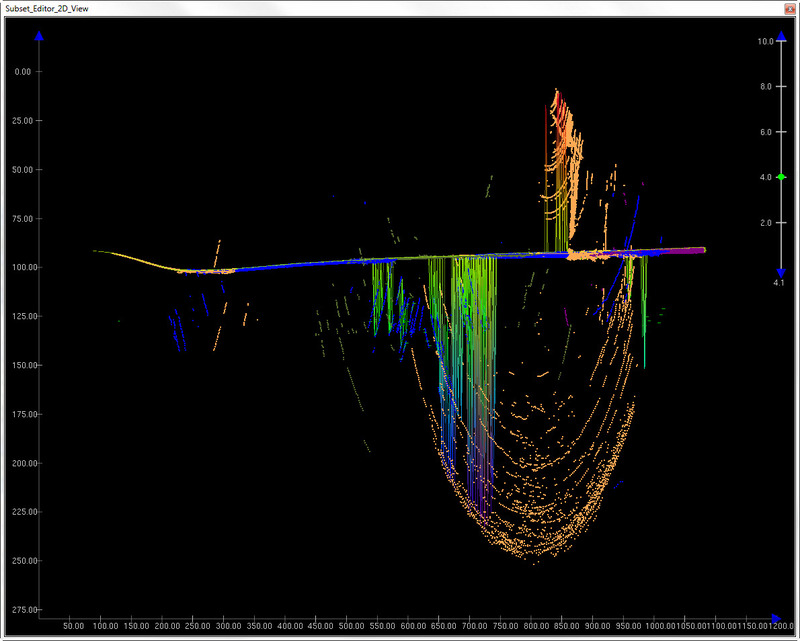 The actual seafloor in this case is the relatively straight line at about 100 meters depth. Monday was the most spectacular day for wildlife viewing! First, I saw a bald eagle. 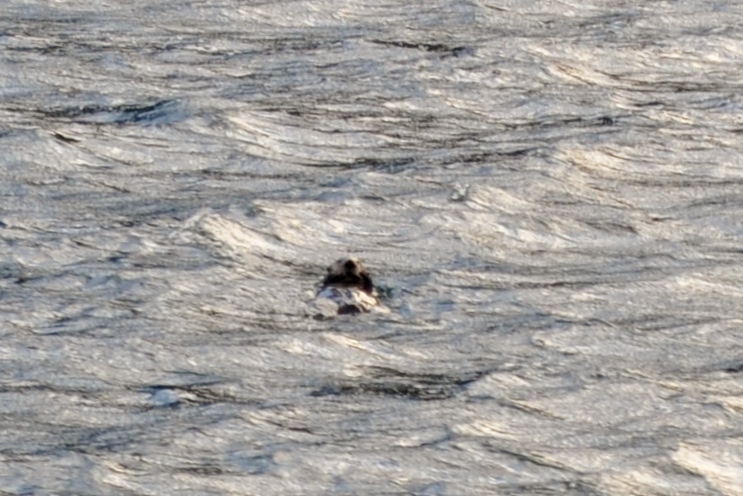 Then, I saw more sea otters. The most amazing experience of my trip so far happened next. Orcas were swimming all around us. They breached (came up for air) less than 6 feet from the boat. They were so beautiful! I got some good pictures, too! As if that wasn’t good enough, we also saw another type of whale from far away. I could see the blow (spray) from the whale and a dorsal fin, but I am not sure if it is was a Humpback Whale or a Fin Whale. Too cool! Killer whales are technically dolphins, because they are more closely related to other dolphins than they are to whales. The top part of a tidal station. In the plastic box is a computer and the pressure gauge. In a previous post, I discussed how the multibeam sonar data has to be corrected for tides, but where does the tide data come from? Yesterday, I learned first hand where this data comes from. Rainier‘s crew sets up temporary tidal stations that monitor the tides continuously for at least 30 days. If we were working somewhere where there were permanent tidal station, we could just use the data from the permanent stations. For example, the Atlantic coast has many more permanent tidal stations than the places in Alaska where Rainier works. Since we are in a more remote area, these gauges must be installed before sonar data is collected in an area. We are returning to an area where the majority of the hydrographic data was collected several weeks ago, so I didn’t get to see a full tidal station install, but I did go with the shore party to determine whether or not the tidal station was still in working condition. A tidal station consists of several parts: 1) an underwater orifice 2) tube running nitrogen gas to the orifice 3) a nitrogen tank 4) a tidal gauge (pressure sensor and computer to record data) 5) solar panel 6) a satellite antennae. Tidal station set-up. Drawing courtesy of Katrina Poremba. Rainier is in good hands. The tidal station in Terror Bay did need some repairs. The orifice was still in place which is very good news, because reinstalling the orifice would have required divers. However, the tidal gauge needed to be replaced. Some of the equipment was submerged at one point and a bear pooped on the solar panel. No joke! After the tidal gauge was installed, we had to confirm that the orifice hadn’t shifted. To do this, we take manual readings of the tide using a staff that the crew set-up during installation of the tidal station. To take manual (staff) observations, you just measure and record the water level every 6 minutes. If the manual (staff) observations match the readings we are getting from the tidal gauge, then the orifice is likely in the correct spot. Just to be sure that the staff didn’t shift, we also use a level to compare the location of the staff to the location of 5 known tidal benchmarks that were set when the station was being set up as well. As you can see, accounting for the tides is a complex process with multiple checks and double checks in place. These checks may seem a bit much, but a lot of shifting and movement can occur in these areas. Plus, these checks are the best way to ensure our data is accurate. ENS Micki and LTJG Adam setting up the staff, so the surveyor can make sure it hasn’t moved. 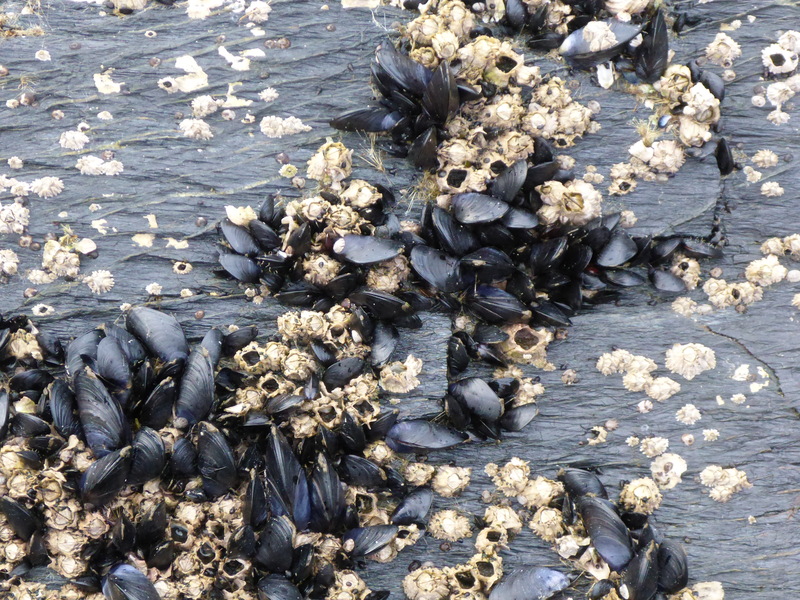 Mussels and barnacles on a rock in Terror Bay. Leveling to ensure staff and tidal benchmarks haven’t moved. Today, I went to shore again to a different area called Driver Bay. This time we were taking down the equipment from a tidal gauge, because Rainier is quickly approaching the end of her 2014 season. Driver Bay is a beautiful location, but the weather wasn’t quite as pretty as the location. It snowed on our way in! 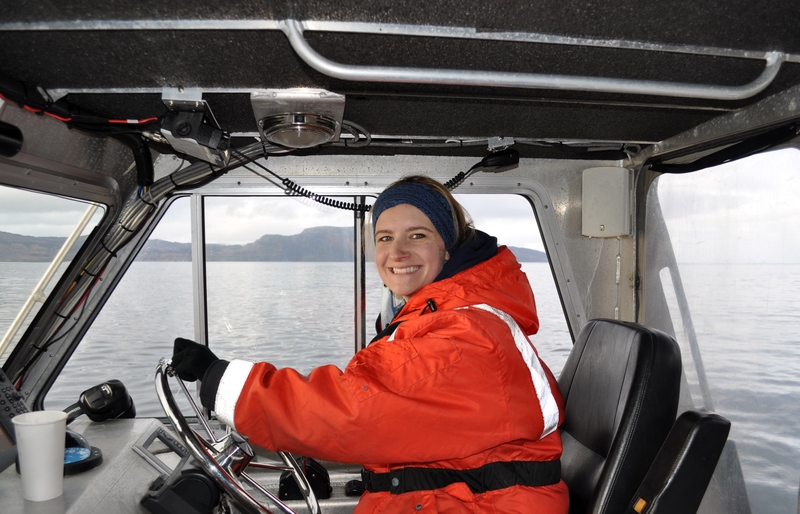 Junior Officer Micki Ream who has been doing this for a few years said this was the first time she’d experienced snow while going on a tidal launch. Because of the wave action, this is a very dynamic area which means it changes a lot. 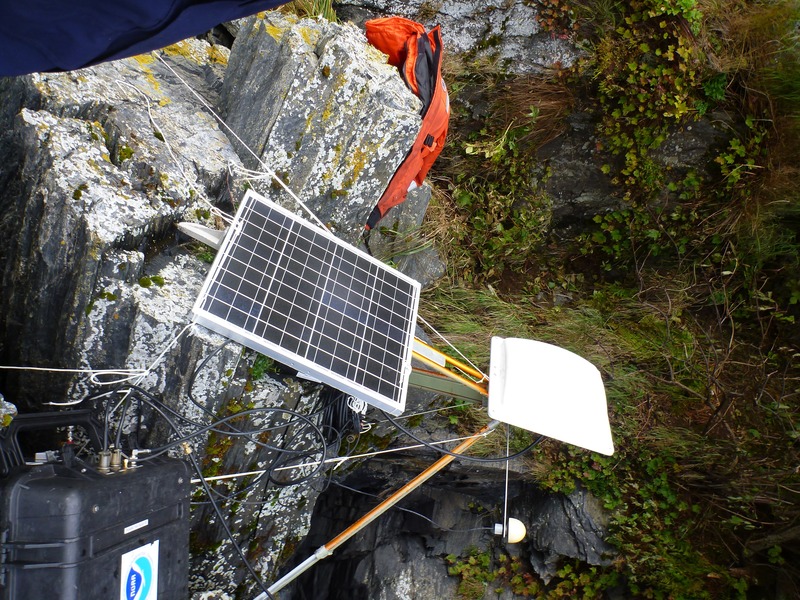 In fact, the staff that had been originally used to manually measure tides was completely gone, so we just needed to take down the tidal gauges, satellite antenna, solar panels, and orifice tubing. The orifice itself was to be removed later by a dive team, because it is under water. After completing the tidal gauge breakdown, we hopped back on the boat for a very bumpy ride back to Rainier. I got a little water in my boots when I was hopping back aboard the smaller boat, but it wasn’t as cold as I had expected. Fortunately, the boat has washers and driers. It looks like tonight will be laundry night. The food here is great! Last night we had spaghetti and meatballs, and they were phenomenal. Every morning I get eggs cooked to order. On top of that, there is dessert for every lunch and dinner! Don’t judge me if I come back 10 lbs. heavier. Another cool perk is that we get to see movies that are still in the theaters! They order two movies a night that we can choose from. Lastly, I haven’t gotten seasick. Our transit from Seward to Kodiak was wavy, but I don’t think it was as bad as we were expecting. The motion sickness medicines did the trick, because I didn’t feel sick at all. NOAA (National Oceanic and Atmospheric Administration) contains several different branches including the National Weather Service which is responsible for forecasting weather and issuing weather alerts. There are sea otters everywhere! 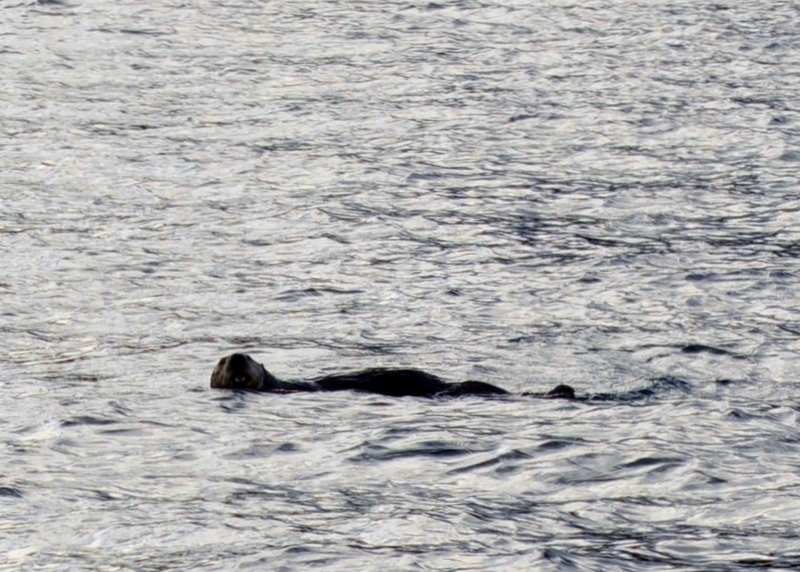 Sea otter (Enhydra lutris) sighting. On Thursday, I got to sit in on Junior Officer Steve Wall and Survey Tech Christie’s discussion of their holiday plan. This does NOT mean they were talking about what they were doing for Thanksgiving or Christmas. A holiday is a space in an area that has already been surveyed where there still isn’t sufficient data. This can happen for a number of reasons. Think about mowing the lawn. If the lawn mower is going back and forth in lines, just as the ship does, sometimes you can still miss a spot (I know I do). With the lawn mower though, it is easy to see where you missed a spot, so you can go back over it immediately. This is not the case with the ship. What’s more, when you are mowing the lawn it is relatively easy to push the lawn mower in a straight line. It is not as easy to drive a ship in a straight line, because currents and weather can be pushing and pulling it in different directions. The purpose of a holiday plan then is to find these missed spots, so a smaller boat can be sent over to fill in those gaps in the data. The holiday plan also tries to figure out how this can be done most efficiently. For example, if holidays are close together you can send out one boat one time to take care of multiple holidays. This is part of the holiday plan that Christie and Steve put together for this next part of our trip. The holidays are the places outlined in yellow and the black are the places where there is already sufficient data. While I have been aboard the ship, I have constantly be learning more about NOAA corps. If you were interested in joining the NOAA corps, the first step would be get a four year (Bachelor’s) degree in a STEM (Science, Technology, Engineering, or Math) field. Many corps members have degrees in Marine Biology. The greatest need is for people with engineering degrees. Once you have your four year degree, you can apply to be in the NOAA corps. If you are accepted in to the program, you will have training for 5 months. This is a combination of class work and hands-on training. When you successfully complete your training, you will be assigned to a ship. You will work on that ship for 2 to 3 years. During those years, your jobs progress in difficulty and vary, so that you can slowly learn how to do it all. All NOAA corps officers are trained on navigating the ship! Even though you are assigned to a ship for 2 to 3 years, you won’t be “gone” the entire time. Each ship has a season when it operates. For example, the Rainier‘s season runs from April to November. When the ship is out of season, it stays in the home port. Rainier‘s home port is Newport, Oregon. Just because the ship is out of season doesn’t mean you don’t work. You still report to the ship daily and work aboard the ship. It is just docked during that time. In the off-season, you may do additional training that would occur off of the ship. Also, many people take their leave during the off-season. NOAA corps officers get 30 days of paid leave a year! After your 2 to 3 years on a ship, you work on land for 2 or 3 years. When you return for your second ship assignment, you will likely have moved up in the ranks. Today, we finally got underway! I was invited to listen in on the evolution required to get the ship underway. Evolution, I quickly learned, has a different meaning in the military then has when we talk about evolution in biology class. An evolution is a set, step-by-step process. To ensure that everything is done properly, there is a check list that must be completed before departure. Some tasks begin an entire day ahead of time. Some of the items required for the checklist include checking the fire doors, heating up the engine (for about 30 minutes), and much much more. Just untying the ship involves multiple steps because of the ship’s size. We actually had to leave two crew members behind to undo the lines. Then, they hopped on one of Rainier‘s smaller boats (called a skiff) and rode back the ship. After they got off of the skiff, Rainier hoisted the skiff up and puts it back in its place. The skiff coming to the ship after the ship was untied from the pier. The skiff being hoisted onto the ship with a crane. Quickly after getting underway, we had our required emergency drills. I had NO idea how realistic the fire drill would be! I thought it would be like a school drill where we just go to our spot and stand around. This was definitely NOT the case. I was sitting in my stateroom (where I sleep) when the alarm sounded which announced it was a drill. The announcement proceeded to say where the fire was located which was the XO’s (Executive Officer) room a few doors down from me. By the time I was in the hall there was smoke, pretend smoke, but smoke! People were going to their stations, some were getting on their fire fighting gear, and in no time, they were fighting the pretend fire with gear on and hoses unwound. I was sent on border control, so basically, I had to go to a bordering area and monitor if the fire was spreading by feeling for heat. The drill was so realistic that there was even an unconscious victim that had to be treated by the medical officer. It is vital to have these realistic drills, because unlike on shore, you cannot just call the fire department. You have to be your own fire department! Almost immediately after the fire drill, we had an abandon ship drill. My group mustered (gathered) at life raft #8 and then, we had to put on our red survival suits. My emergency billet that tells me where to go and what to do in case of an emergency. On Thursday, Meclizine was passed out in the dispensary. This is a medication to prevent motion sickness. I will definitely be taking some. Even if it doesn’t work 100%, I have been given some tips on how to settle the feelings of nausea. It was recommended for one that I get further down in the ship and closer to the center of the ship. 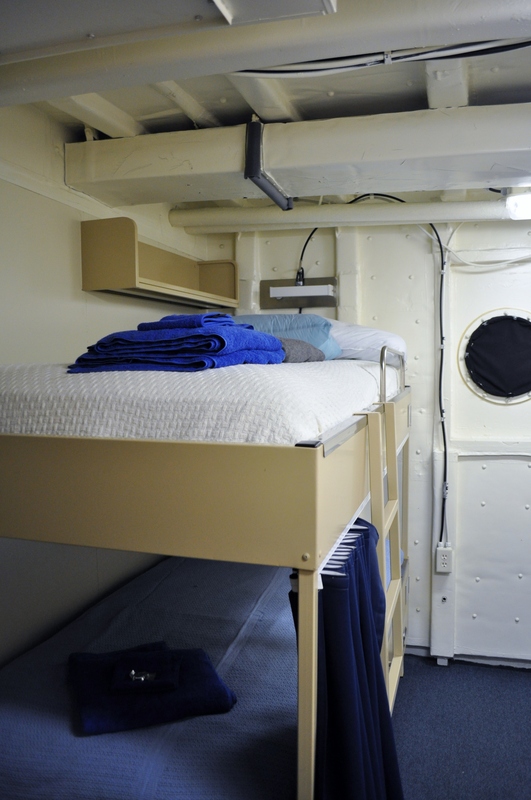 There is a lounge with couches called the ward room that is in a more ideal place to reduce motion sickness than my berthing area, so I may go there if I start feeling bad. If my nausea is still bad, I have been told to go the back of the ship (the fantail) and watch the horizon. You might wonder why watching the horizon off the back of the ship would help. Motion sickness is caused when your senses are giving you conflicting information. So if you are in a ship, your inner ear ,which controls your balance, knows your body is moving, but visually, since the boat is moving with you, your eyes are telling you a different story. This explains why it can be helpful to go to the fantail. Your visual sensory input (what you see) will match more with what your inner ear is telling your brain if you are watching the movement. 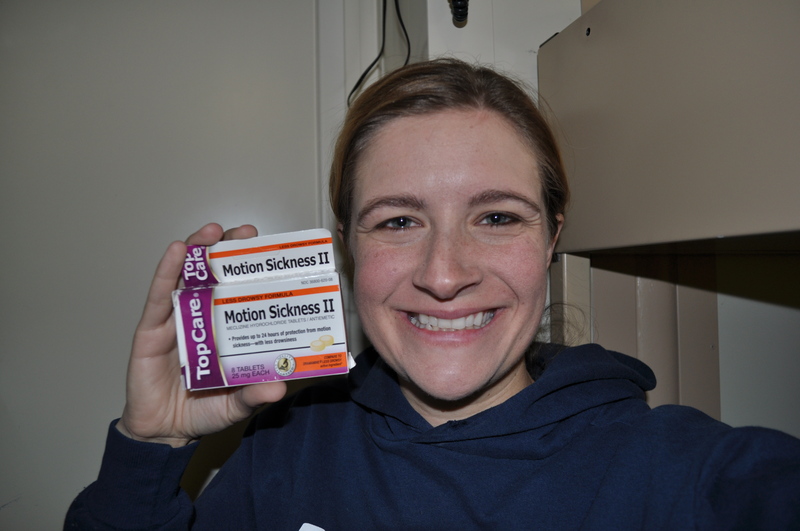 Selfie with my motion sickness medicine. Between the fire drill and the abandon ship drill, the captain called me up the bridge (the place where you control the ship). He wanted me to see all of the orcas (killer whales). There was a whole pod of them. 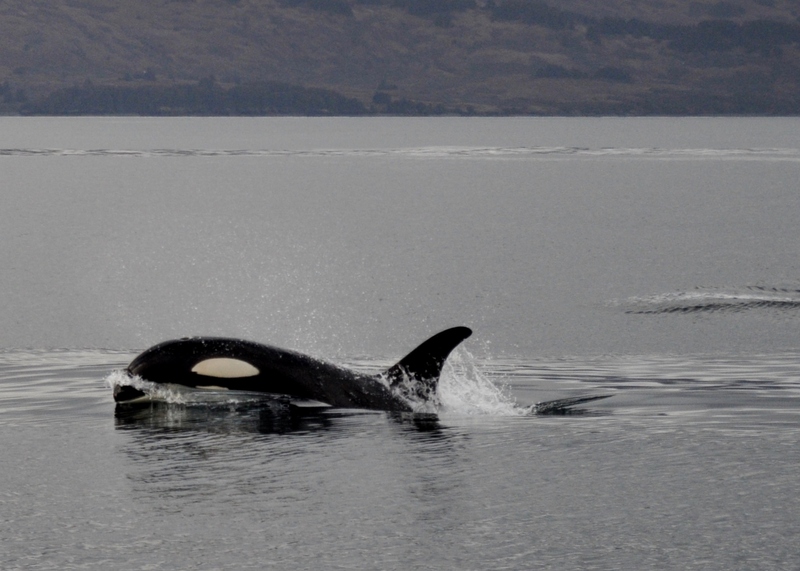 There were possibly 50 orcas (Orcinus orca) and they were pretty close to the ship at times! There were also dall’s porpoise’s (Phocoenoides dalli) swimming in our wake. It was so cool! 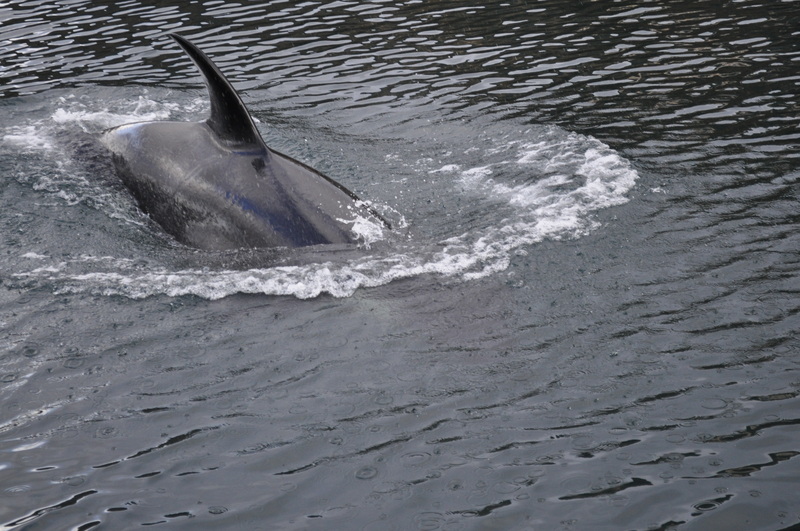 Here is a picture of dall’s porpoises like the ones we saw today. This photo was taking by Teacher at Sea alumna Britta Culbertson. There is more than one way to “rock the boat.” The ship can pitch, roll, or yaw. Thursday night I saw a bald eagle (Haliaeetus leucocephalus) by the piers. I didn’t get a picture, because it flew way too fast. It was still awesome though! Junior Officer Micki Ream diving in Thumb’s Cove. Photo courtesy of Junior Officer Katrina Poremba. The launch that I participated in on Tuesday was awesome! We went to an area called Thumb’s Cove. I thought the divers must be crazy, because of how cold it was. When they returned to the boat from their dive, they said the water was much warmer than the air. The water temperature was around 10.5°C or 51°F while the air temperature was hovering right above freezing. One diver, Katrina, took an underwater camera with her. They saw jellyfish, sea urchins, and sea stars. The ride to and from the cove was quite bouncy, but I enjoyed being part of this mini-adventure! Later that day, we did what is called DC (Damage Control) familiarization. Basically, we practiced what do in case of an emergency. We were given a pipe with holes in it and told to patch it with various objects like wooden wedges. We also practiced using a pump to pump water off of the ship if she were taking on water. Safety drills are also routine around here. It’s nice to know that everyone expects the best, but prepares for the worse. I feel very safe aboard Rainier. 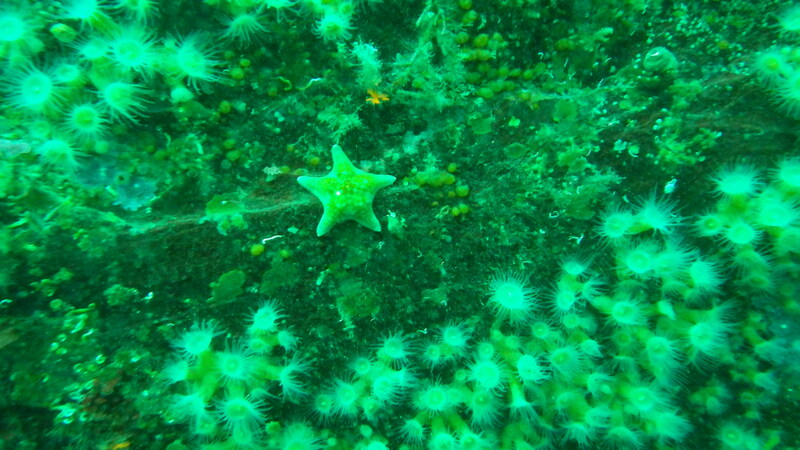 Sea star and anemones taken by diver Katrina Poremba at Thumb’s Cove. 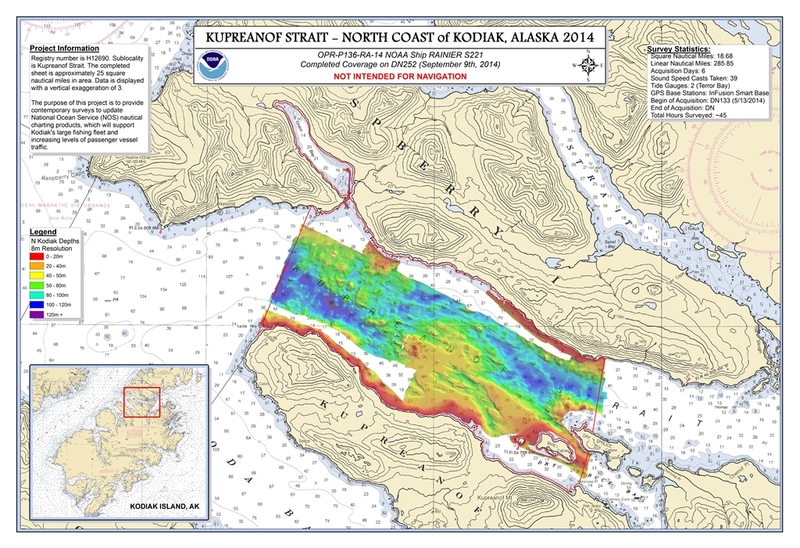 This source diagram from Kodiak Island shows when the latest data was collected in for an area. We will be working near the red x. Today, I got a chance to meet with the CO (Commanding Officer), and he explained the navigational charts to me. Before the ship leaves the port, there must be a navigation plan which shows not only the path the ship will take, but also the estimated time of arrival to various points along the way. This plan is located on the computer, but also, it must be drawn on a paper chart for backup. This illustrates again how redundancy, as I discussed in my last blog post, is a very important part of safety on a ship. 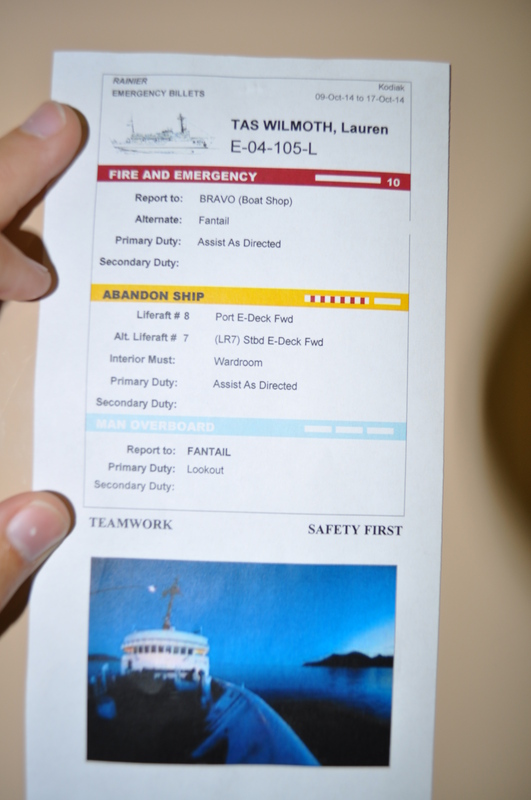 Every ship must have up-to-date paper charts on board. 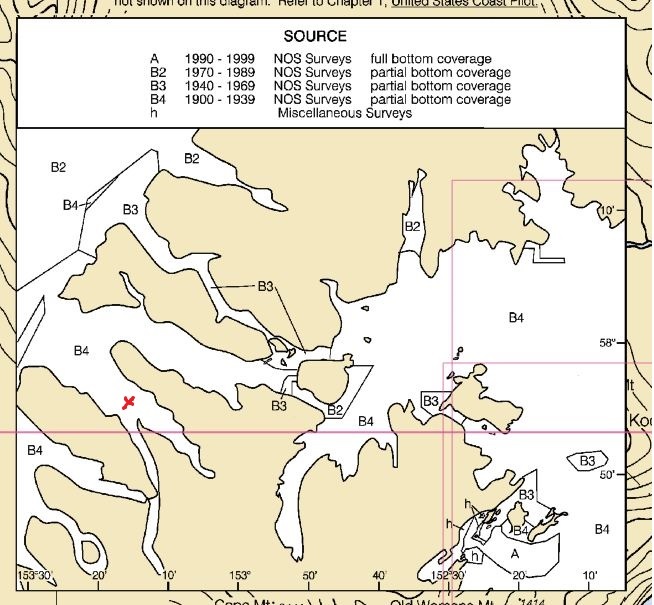 These charts get updated with the information collected from the hydrographic surveys. The ocean covers more than 70% of our planet which is why Rainier‘s mission of mapping the ocean is so important. 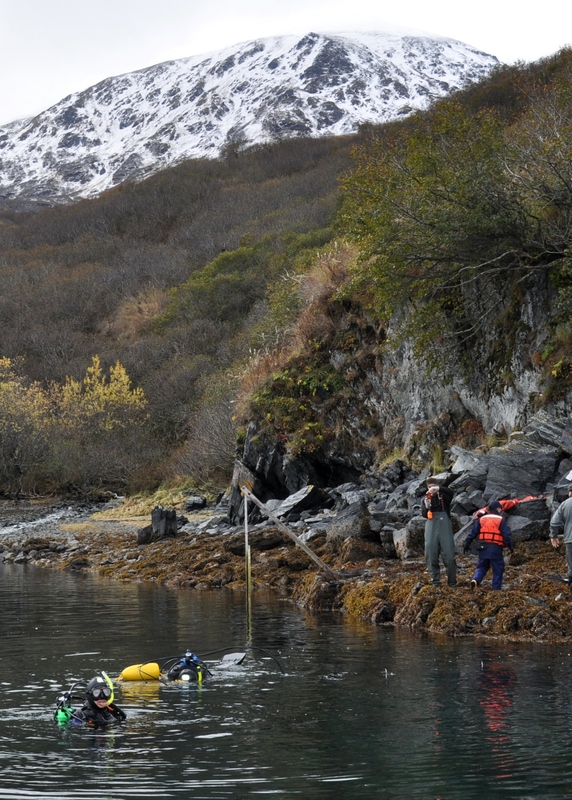 There are many areas in Alaska where the only data on the depth of the water was collected before sonar technology was used. In fact, some places the data on the charts comes from Captain Cook in the 1700s! If you look at the chart below the water depth is measured in fathoms. A fathom is 6 feet deep. Places that are less than 1 fathom deep have a 05 where the subscript indicates how deep the water is in feet. 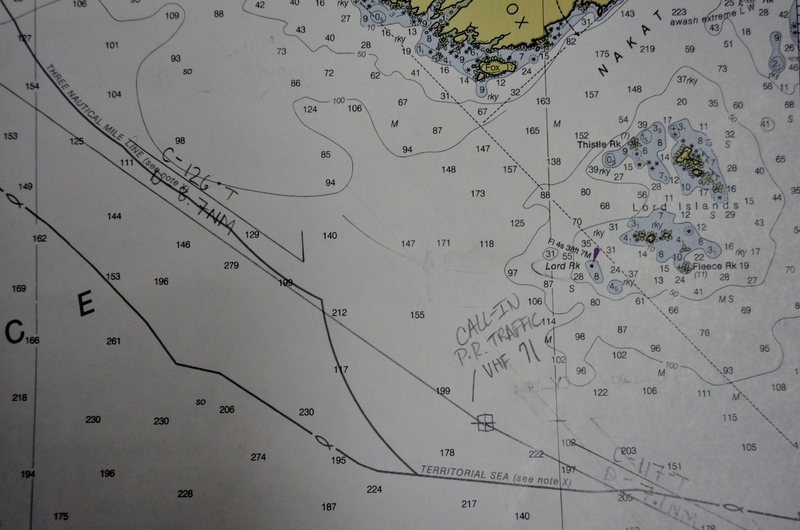 One of the nautical charts that will help Rainier navigate back to its home port in Newport, Oregon. Notice the ocean depth marked in fathoms. 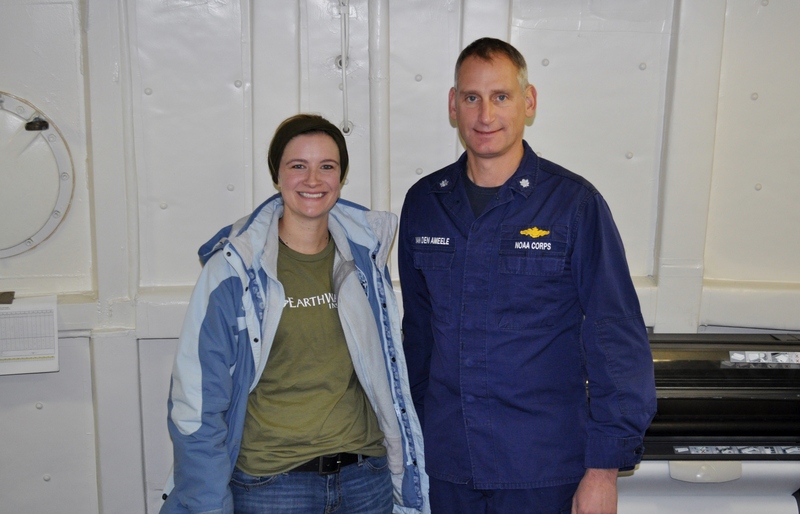 CO (Commanding Officer) and me after discussing nautical charts. They believe this will work, because the sonar produces a back scatter signature that can give you an idea of the sea floor composition (i.e. what it is made of). For instance, they could tell you if the sea floor is rocky, silty, or sandy using just sonar, as opposed to, manually taking a bottom sample. If this hydrographic data is integrated with the data collected by other NOAA ships that use trawl nets to survey the fish in an area, this would allow NOAA to manage fisheries more efficiently. For example, if you have map that tells you that an area is likely to have fish fry (young fish) of a vulnerable species, then NOAA might consider making this a protected area. 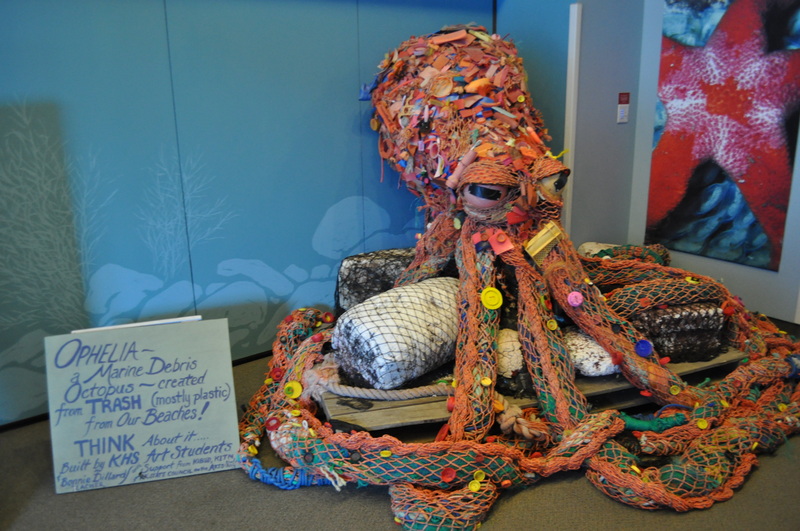 Artwork from the SeaLife Center created by high school students to illustrate how much trash ends up on our beaches. On Tuesday, I had a little extra time in the afternoon, so I decided to ride my bike down to the Alaska SeaLife Center which is a must-see if you ever find yourself in Seward. 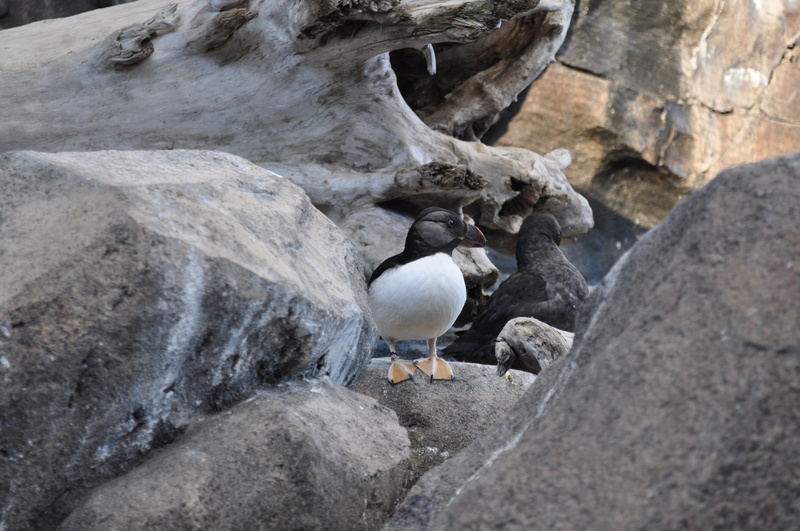 There were Harbor Seals (Phoca vitulina), Stellar Sea Lions (Eumetopias jubatus), Puffins (Genus Fratercula), Pacific Salmon (Genus Oncorhynchus) and much more. I really appreciated that the SeaLife Center focused on both conservation and on organisms that live in this area. A local high school even had their art students make an exhibit out of trash found on the beach to highlight the major environmental issue of trash that finds its way to the ocean. Can you think a project we could do that would highlight a main environmental concern in Eastern Tennessee? I also thought is was really interesting to see the Puffins dive into the water. The SeaLife Center exhibit explained about how Puffin bones are more dense than non-sea birds. These higher density bones are an adaptation that helps them dive deeper. I officially moved into the ship today. Prior to that, I was staying at a hotel while they were finishing up repairs. We are expected to get underway on Friday afternoon. I am staying in the princess suite! It is nice and cozy. I have all of the essentials. I have a desk, bunk beds, 2 closets, and one bathroom (head). Junior Officers get homework assignments just like you. At the navigation briefing today, the CO (Commanding Officer) told the Junior Officers what that they needed to review several documents before going through the inside passage (a particularly tricky area to navigate). He is expecting them to lead different parts of the next navigation briefing, but he isn’t going to tell them which part they are leading until right before. Therefore, it is important that they know it all! It’s a little like a pop quiz and presentation in one. Bathymetry – the study of the “beds” or “floors” of bodies of water. 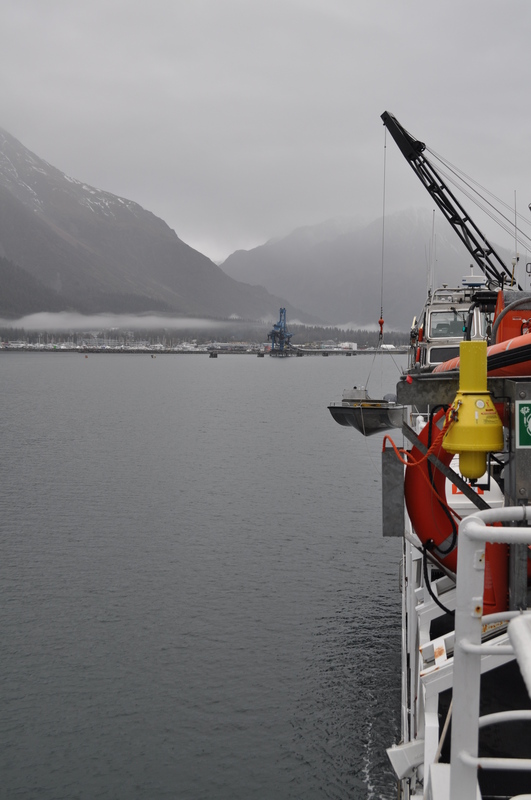 Our departure from Seward was originally scheduled for today, but the ship is having some repairs done, so our expected departure is now Wednesday or Thursday. In case you were wondering, this doesn’t delay my return date. Regardless of the fact that we are not underway, there is still so much to learn and do. Yesterday, I met with Christie, one of the survey techs, and learned all about the Rainier’s mission. 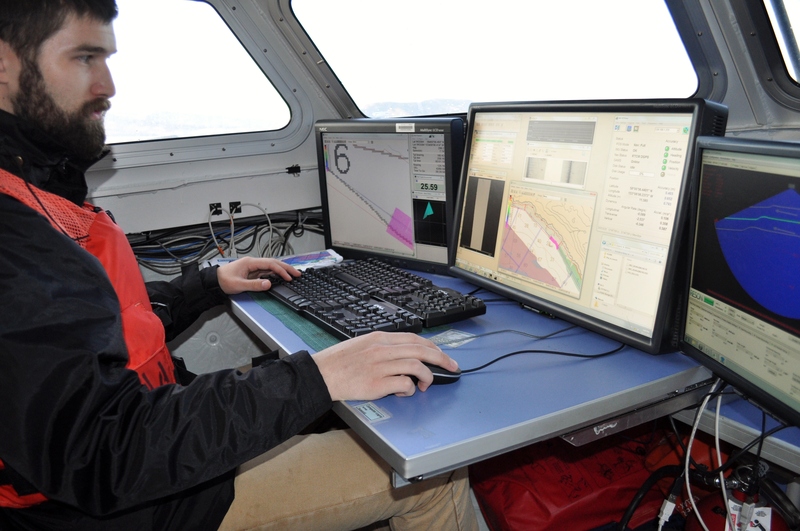 The main mission of the ship is to update nautical charts. Up-to-date charts are crucial for safe navigation. The amount of data collected by Rainier if vast, so although the main mission of the Rainier is updating nautical charts, the data are also sent to other organizations who use the data for a wide variety of purposes. The data have been used for marine life habitat mapping, sediment distribution, and sea level rise/climate change modeling among other things. In addition to all of that, Rainier and her crew sometimes find shipwrecks. In fact, Rainier and her crew have found 5 shipwrecks this season! 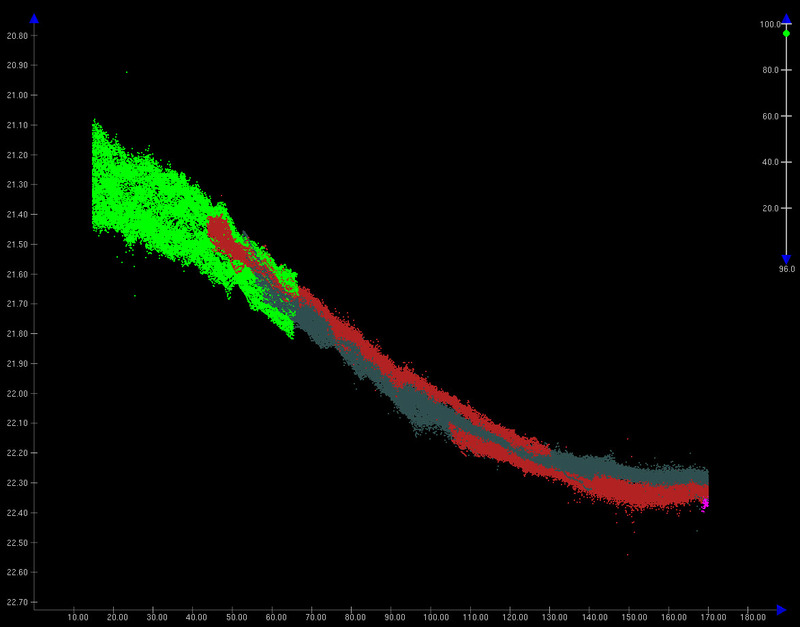 This is what a shipwreck looks like to the sonar. This is a picture of a shipwreck found by another NOAA hydrographic ship. Photo courtesy of NOAA. Simplified, hydrographic research involves sending multiple sonar (sound) beams to the ocean floor and recording how long it takes for the sound to come back. You can use a simple formula of distance=velocity/time and divide that by two because the sound has to go to the floor and back to get an idea how deep the ocean is at a particular spot. This technique would be fine by itself if the water level weren’t constantly fluctuating due to tides, high or low pressure weather systems, as well as, the tilt of the ship on the waves. Also, the sound travels at different speeds according to the water’s temperature, conductivity and depth. Because of this, the data must be corrected for all of these factors. Only with data from all of these aspects can we start to map the ocean floor. I have attached some pictures of what data would look like before and after correction for tides. 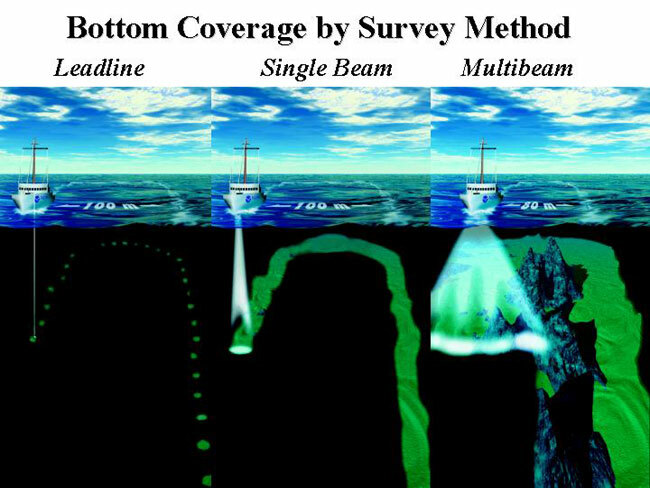 This shows the advantages of using multibeam sonar to complete surveys. Photo courtesy of NOAA. Hydrographic data with correction for tides. Photo courtesy of Christie. I was also given a tour of the engine room yesterday. Thanks, William. He explained to me how the ship was like its own city. In this city, there is a gym, the mess (where you eat), waste water treatment, a potable (drinkable) water production machine, and two engines that are the same type of engines as train engines. Many of my students were interested in what happens to our waste when we are aboard the ship. Does it just get dumped into the ocean? The answer is no. Thank goodness! The waste water is exposed to bacteria that break down the waste Then, salt water is used to produce chlorine that further sterilizes the waste. After those two steps, the waste water can be dumped. The drinking water is created by evaporating the water (but not the salt) from salt water. The heat for this process is heat produced by the engine. William also explained that there are two of everything, so if something fails, we’ll still be alright. 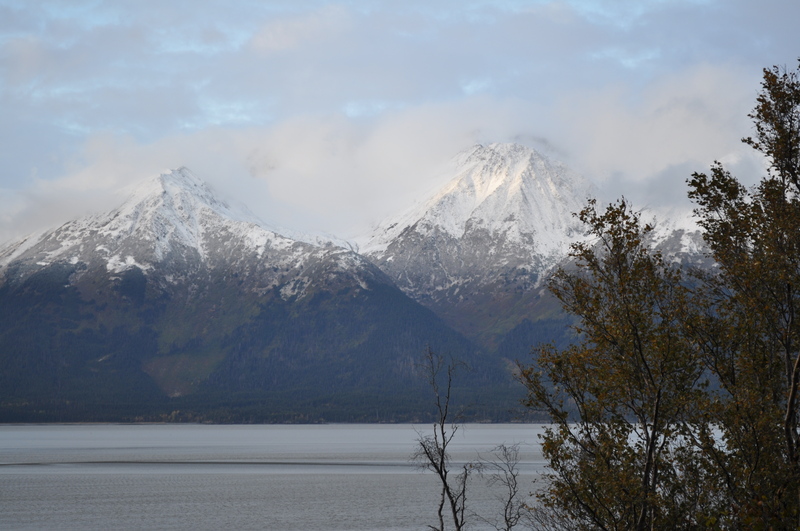 Sunday, I drove from Anchorage to Seward. The drive was so beautiful! At first, I was surrounded by huge mountains that were vibrant yellow from the trees whose leaves were turning. Then, there was snow! It was actually perfect, because the temperature was at just the right point where the snow was melted on the road, but it had blanketed the trees. Alaska is as beautiful as all of the pictures you see. The drive should have been about 2.5 hours, but it took me 3.5 hours, because behind each turn the view was better than the previous turn, so I had to stop and take pictures. I took over 100 pictures on that drive. 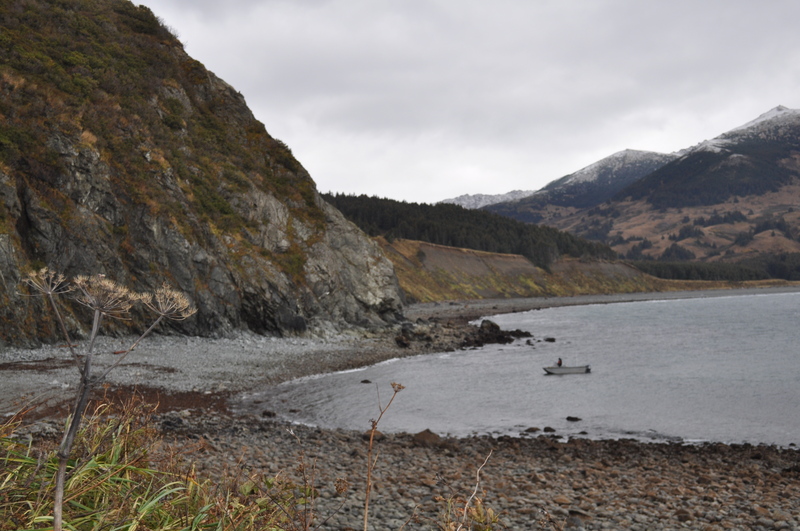 Once I arrived in Seward, I was given my first tour of the ship and then I had some time to explore Seward. Yesterday (the first official day on the job), I learned so much. Getting used to the terminology is the hardest part. There are acronyms from everything! 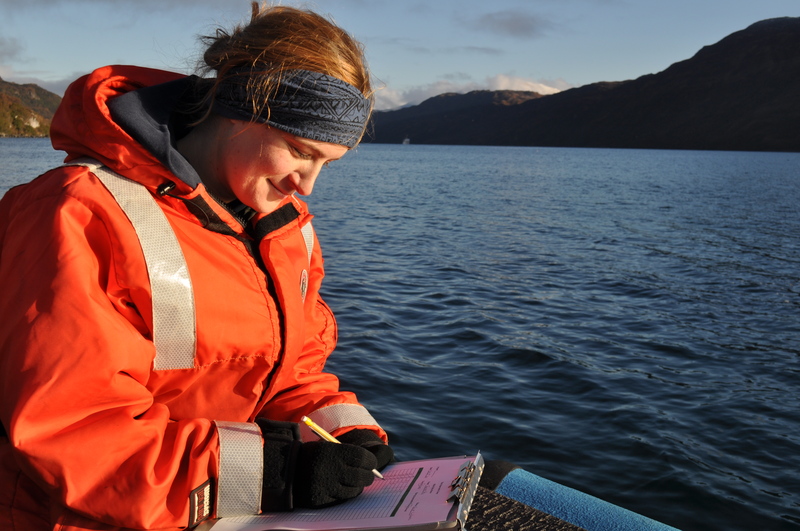 Immersion is the best way to learn a foreign language, and I have been immersed in the NOAA (National Oceanic and Atmospheric Administration) language. There is the CO (Commanding Officer), XO (Executive Officer), FOO (Field Operations Officer), TAS (Teacher at Sea or Me! ), POD (Plan of the Day) and that is just the tip of the iceberg. I also had to learn all of the safety procedures. 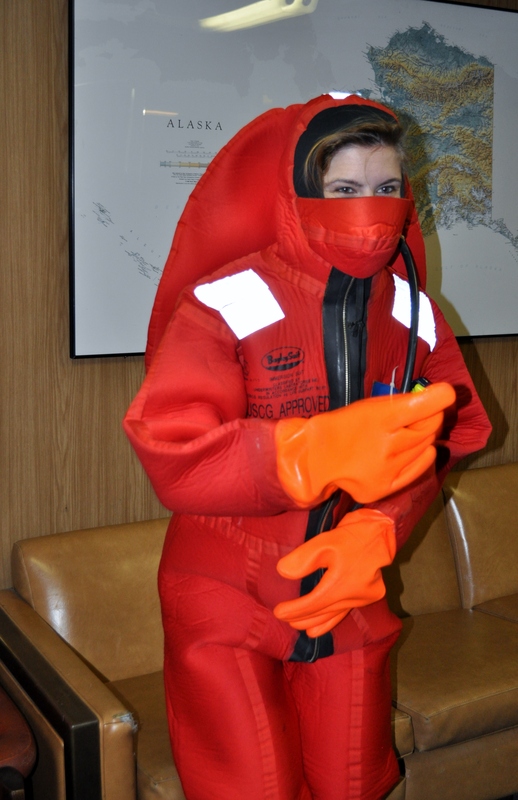 This involved me getting into my bright red survival suit and learning how to release a lifeboat. Today, I am going on a dive launch. 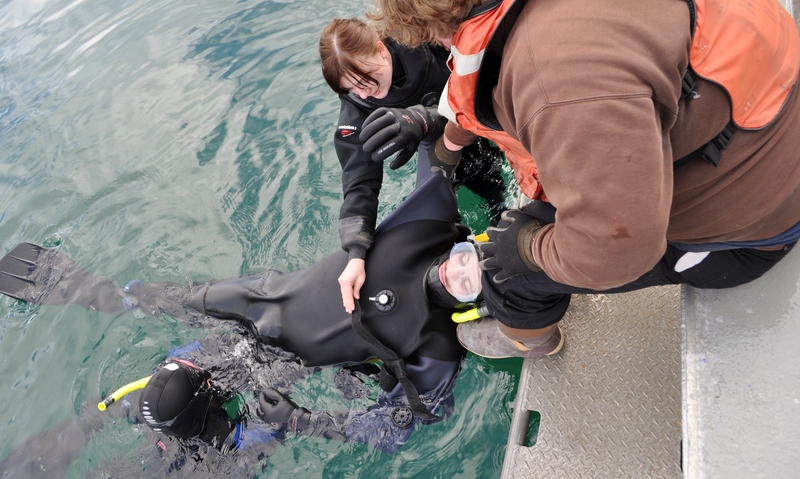 The purpose of this launch is to help some of the divers get more experience in the cold Alaskan waters. I will get to ride on one of the smaller boats and watch as the Junior Officers scuba dive. NOAA Corps is one of the 7 branches of the U.S. uniformed services along with the Army, Navy, Coast Guard, Marine Corps, Air Force, and the Public Health Service Commissioned Corps (PHSCC). My name is Lauren Wilmoth, and I have been teaching biology at Jefferson County High School in Dandridge, TN for 3 years. Prior to teaching in Jefferson County, I conducted research on pipevine swallowtail (Battus philenor) caterpillars in East Tennessee as a part of my master’s thesis at the University of Tennessee Knoxville. My research involved a lot of hiking in the woods and catching butterflies with my net. Who wouldn’t enjoy that? 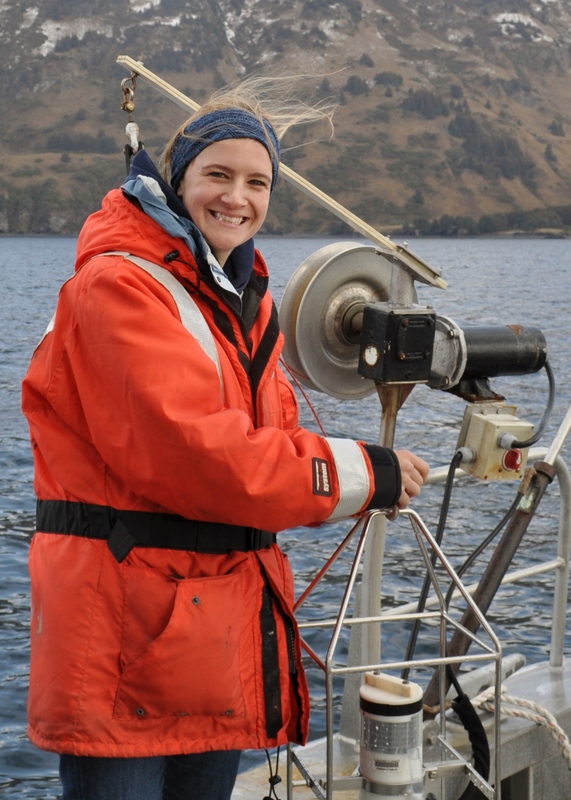 I learned a lot about how science works while obtaining my master’s degree, and now, as a teacher, I get to share my fascination with nature and my expertise with my students! 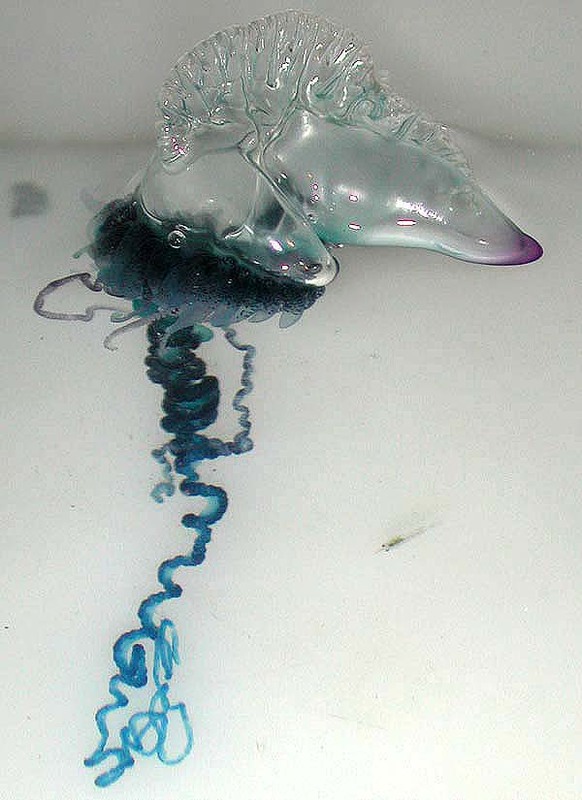 A Portuguese Man-of-War (Physalia physalis) like the one I saw as a child. Photo courtesy of NOAA. I grew up in Alabama, and like many families in Alabama, mine spent many spring breaks at the beach. We camped every year at state parks on the Florida panhandle. It was on these trips that I began to appreciate the ocean as a fun and interesting place. We enjoyed the dune trails and the peculiar dune ecosystems. We even went deep sea fishing one time, and I didn’t get seasick! (Hopefully, I will be able to say the same after this trip). I distinctly remember one time when a Portuguese Man-of-War jellyfish (Physalia physalis) washed ashore. It was the highlight of my trip to see this strange creature I had never even heard of! Although I grew up enjoying the ocean and it’s bounty (crab and shrimp are my favorites), I didn’t start to understand its importance until I became a biology major in college (oddly enough in the landlocked state of Arkansas). No matter where you live, you are connected to the ocean through its role in our climate, our water cycle, and as the main source of oxygen on our planet among other things. The ocean intrigues me with its mystery, and that is the reason I applied to be a part of this NOAA (National Oceanic and Atmospheric Administration) Teacher at Sea Program. I am thrilled about this once in a lifetime opportunity to help with hydrographic research off of the coast of Alaska this fall. In fact, I learned the news of which cruise I would be on while at Dublin Airport after an amazing vacation with my husband in Ireland. I checked my e-mail and let out an audible shrill of excitement. 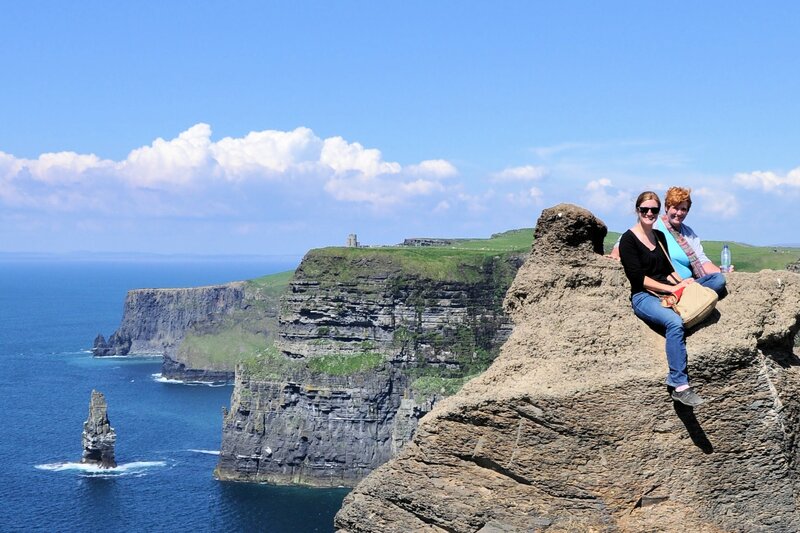 My mother-in-law and me at the Cliffs of Moher in Ireland earlier this summer. 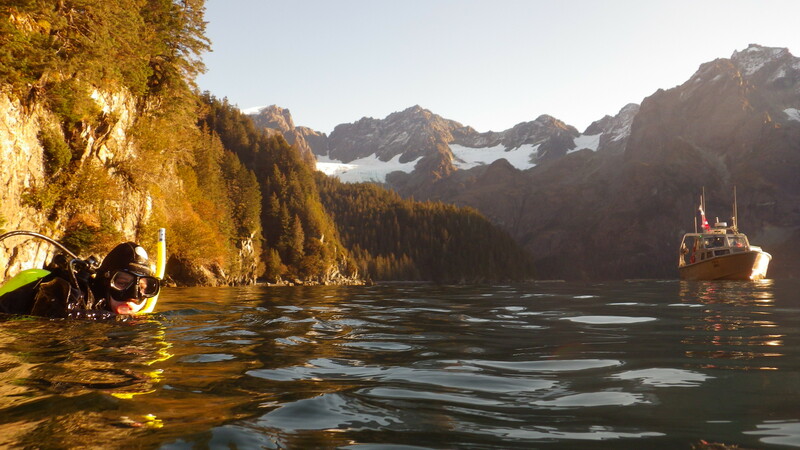 I have never been to Alaska, and I know very little about hydrographic research. This cruise excites me, because I will have the opportunity to learn something complete new, and after the cruise, I will be able to share what I learned with my students and colleagues! In case you were wondering, hydrographic research involves mapping the ocean floor which is particularly important for safe navigation in these waters. Also, hydrographic research can involve determining the composition of the seafloor. 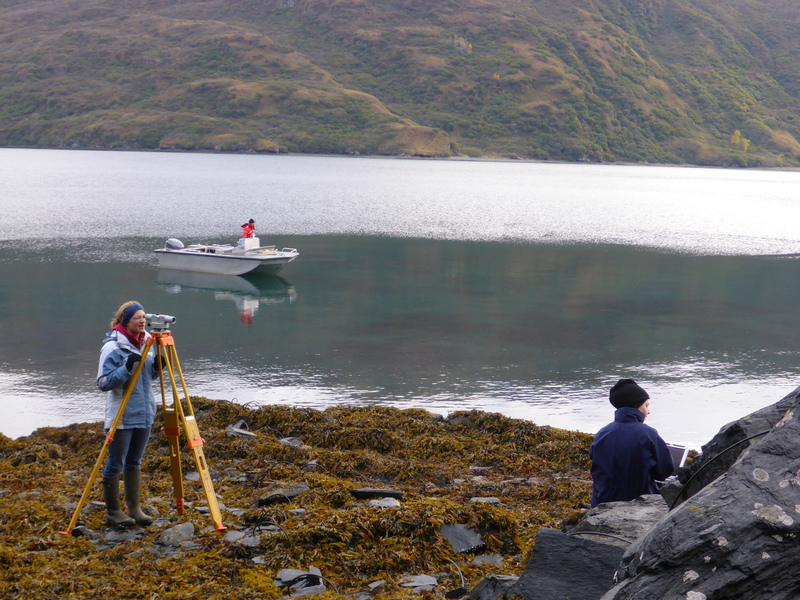 If you want to learn more about hydrographic surveys, click on the link. Of course, you can also learn more about our hydrographic survey by continuing to read my blog during my trip. To complete this hydrographic research, I will be working with the NOAA team aboard the NOAA Ship Rainier. It contains a lot of fancy equipment used to complete these surveys that I hope to gain a better understanding of on this trip. This is a large ship. It is 231 feet long and is equipped with a dining area and 8 smaller boats! To give you some perspective on its size, it would reach from the end goal line on a football field to the 23rd yard line on the opposite side of the field! 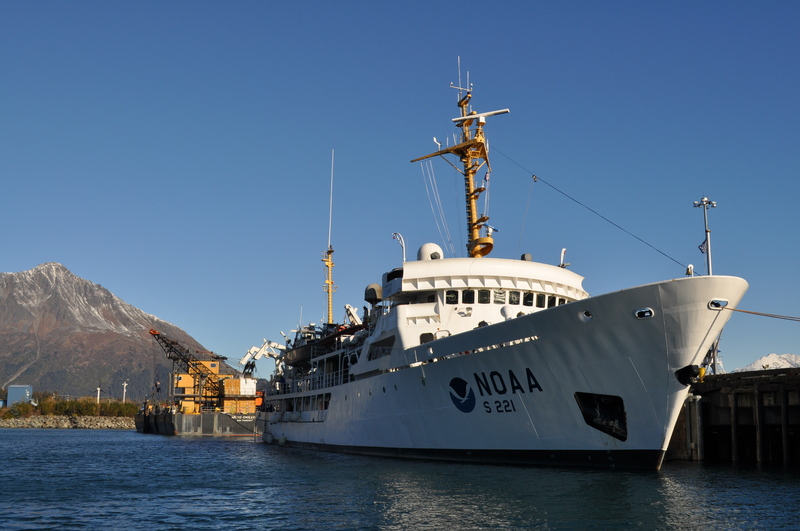 To learn more about NOAA ship Rainier click the link. 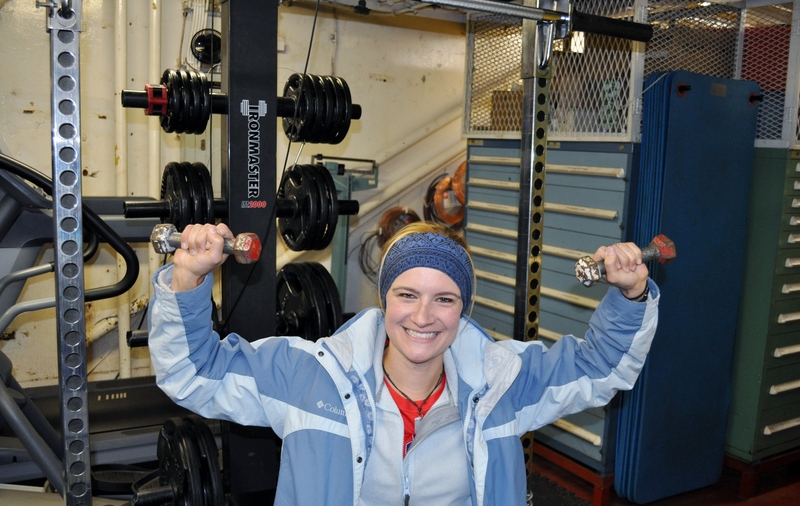 Stay tuned to my blog to hear firsthand what life aboard NOAA Ship Rainier is like. Rainier through an iceberg. Photo courtesy of NOAA.